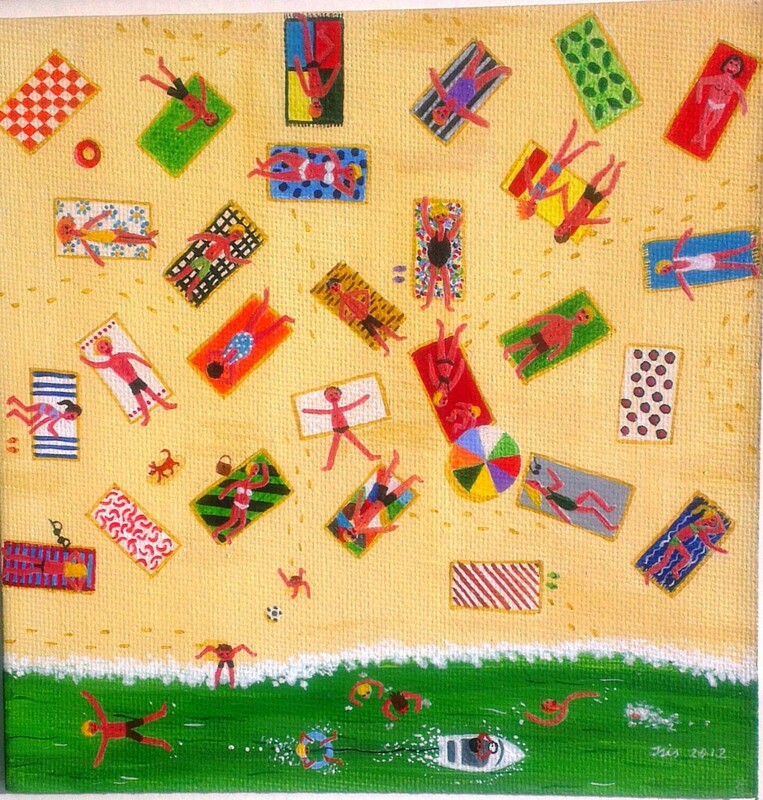 So as some of you may already know that read my artblog last week 180 ART AND THE KINDNESS OF STRANGERS that I was just given a wonderful Danish Naive artbook called “Naivister i Danmark” written by Ole Lindboe and also incredibly 3 original paintings. These amazing gifts were sent by the Danish art gallery owner Knud Grothe who runs the fabulously successful art gallery called GALERIE KNUD GROTHE in Charlottenlund, Copenhagen, Denmark. Charlottenlund is one of the most affluent suburbs in Copenhagen and got it’s name from Princess Charlotte Amalie, she is the daughter of King Frederick lV and the sister of King Christian Vl who rebuilt the Gyldenlund Palace in 1733 and named it Charlottenlund Palace after her. This suburb Charlottenlund is also the home to Danish celebrities and corporate executives and lots of other wealthy individuals and families, the suburb has lots of gorgeous ocean views and most of the mansions and estates are around the Strandvejen (Beach Road). Anyway the paintings I was so generously given are on stretched canvas and one on canvas board by 3 naif artists; Isis de Sequeira, Jan Thomas and Inge Selmer, all very different but equally wonderful. Isis originally heralds from Brazil but these days live in Denmark and this particular work is a very detailed miniature beach scene with a lovely green ocean with people enjoying the sun and surf called Danish Bacon (which I imagine is tongue in cheek for smoking or cooking your body in the sun). It is reminiscent of the days I have spent by the Australian beach and no doubt has been influenced by the travelling that Isis has done as well. 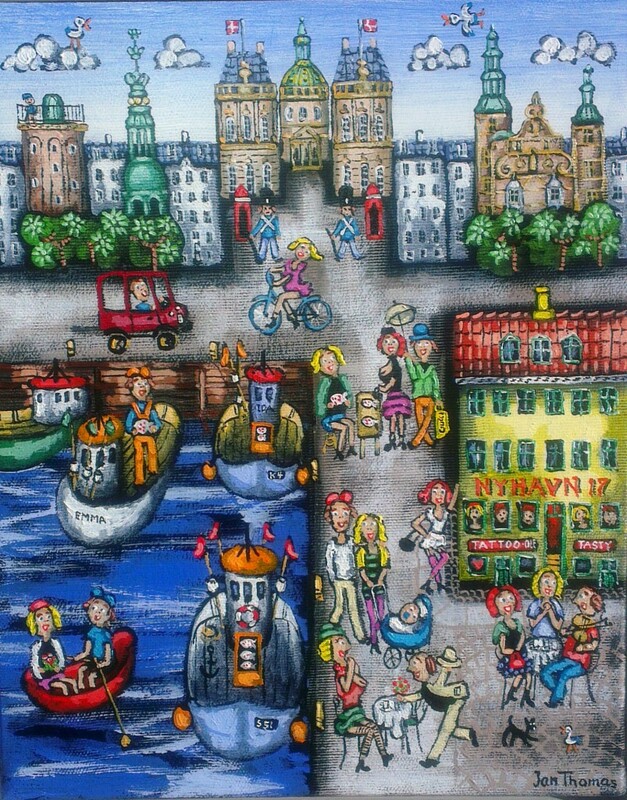 Jan’s distinctive artwork is called Nyhavn which is the 17th-century waterfront canal and entertainment district in Copenhagen, Denmark. Nyhavn was actually constructed by King Christian V and dug by Swedish war prisoners from the Danish-Swedish War in 1658-1660. In those days it was notorious for beer, sailors and prostitution but these days is brightly lined by coloured 17th and early 18th century townhouses and bars, cafes and restaurants. Jan has captured the ambiance of this district with a family out for a Sunday stroll, a fish monger, tattoo parlor, a prostitute waiting for business, musicians and much more. 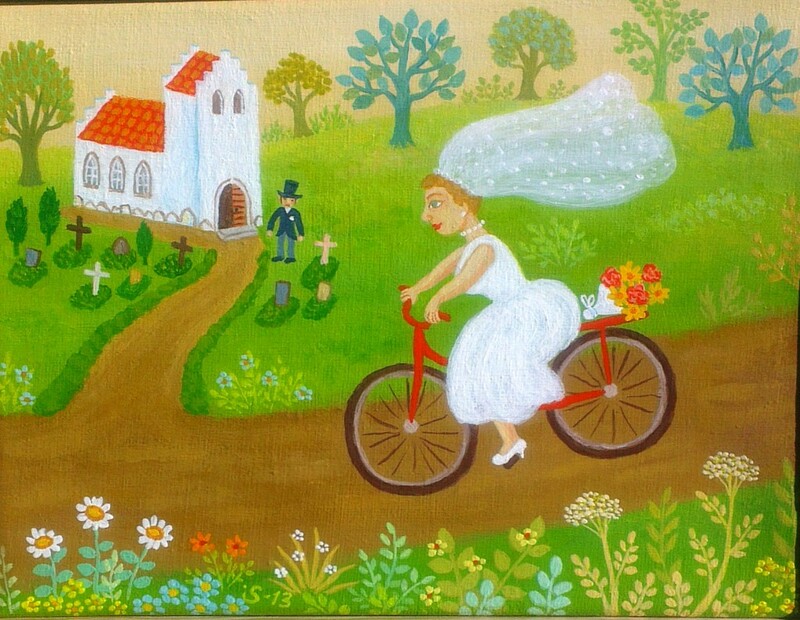 Artist Inge Selmers bride cycling to the church on time! The third painting I received was by Inge Semler who says that when she paints she disappears into her own little world and it is never too late to get oneself a happy childhood. This gorgeous work sees a bride in all her finery furiously pedaling her bike through the green countryside to get to the church on time with her veil blowing behind her in the wind. The title is “The Groom awaits” which suits the painting down to a T.
Again thank you very much Knud for your generous gifts which is giving me so much pleasure every day.